This is the one I am most proud of: TBR on yet another special mention in the papers. (Click here for TBR’s “press debut”.) 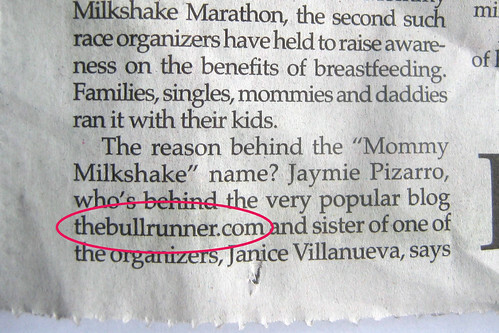 I just love it when TBR gets more attention than little ol’ Jaymie does. a great web site and stunning info. I will bookmark this web site. sports magazines must be calling you by now!!! tanya beat them to it! ben (the flash) bring out those shots of TBR!!! Mikey, president din pwede? Ay, wag nalang. KQ, wait sino ka doon?! Earplugs, my TV appearance will be at the next olympics pa. Kidding! Hey TBR, what a great article and photos. Congratulations again and keep on running! Wow read the article, when will we see the TV appearance?? wow another media exposure for TBR! yeah saw it ! sarap ng feeling kasi singit ako wee! keep running… It’s something good to know. Well long I’ve been expecting it and I’ll never be surprise if someday I will hear more. Congrats! TBR for baragay kagawad, councilor, congresswoman, or senator! 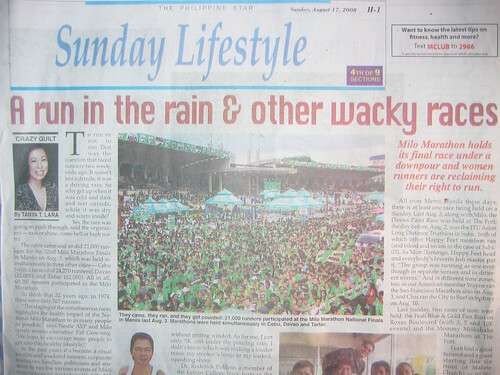 will keep the newspaper article so next time I say TBR again, have some proof that you really exist hahahaha….